Shutdowns generally end like this and are as painful as this looks. Notice how her feet are in space and can't push against anything to break the fall. If, like me, you ride slower than you can run, overleans and other mishaps can be recovered by stepping off but the physics is different in a shutdown and you can't just step off. It is like this. This guy demonstrates the technique for an unpowered dismount. 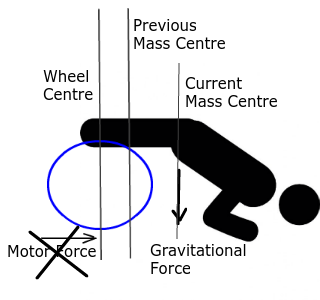 From the moment of unbalance he is falling but he lifts his knee quickly enough to get his foot forward under his body and uses the forward momentum to lift him like a pole vaulter. He knows it's coming and the physics is not opposite to what he is expecting so a shutdown for you is more difficult than for him. My four ended in more pain than any other mishap. On many wheels battery protection has been prioritised over rider protection which can lead to a shutdown without warning. Wheels designed this way and fitted with low quality batteries can shut down at any time but even with good batteries they become dangerous as the batteries age. A rider is only likely to be aware of a rare and mysterious catastrophic failure on a wheel that was for a long time safe. Early battery replacement with good cells will avoid shutdowns or the battery can be modified. The graph below for an Airwheel X8 shows published battery data overlaid with testing data of an aging cell X (black), damaged cells X (grey) and a generic battery with different, damaged cells X (blue). The discharge rate for the X tests was 0.2 amps. The aging cells were still able to sustain a voltage above the tilt back/warning voltage long enough to warn a rider but the damaged cells went from above the warning voltage to below the shutdown voltage too quickly. The generic battery had a shutdown voltage higher than the warning voltage, making it unsuitable for this Airwheel X8 from new. A longer version of this summary is published elsewhere. many wheels battery protection has been prioritised over rider protection which can lead to a shutdown without warning. Wheels designed this way and fitted with low quality batteries can shut down at any time but even with good batteries they become dangerous as the batteries age. Airwheel has missed the train a long, long time ago...i guess since over two years they havent put out a new model. First day riding I met a woman who was out on an airwheel X5 who showed me a scar across her forehead and told me the knocked out nine teeth when she faceplanted off of her wheel a year ago. Apparently her wheel was broken and airwheel gave her a hard time about replacing it and she had to prove it had been a mechanical failure. top quality brands like GW, KS, Inmotion, Ips are not designed like this anymore. with the exception of seeing it suggested that KingSong wheels do not have switches in the BMS to disconnect the battery from the main board. How is it solved in the other brands, have wheel manufacturers abandoned low voltage battery protection entirely? Have they implemented the solution I suggested under the heading What Can Manufacturers Do? . If I go to buy a wheel BMS from Aliexpress I see they have low voltage shutdown and if I buy a replacement battery they have low voltage shutdown. One of my shutdowns was inevitable because the replacement battery had the low voltage shutdown set higher than the X8 tilt back voltage, which must happen to others as well. You have to have a good understanding of the issues to even think of checking this. Yes, but as far as I can tell based on numbers of eBay listings, Airwheels and generics are still the best selling. They will all become dangerous as they age and generics with low quality batteries are dangerous from first use because of the design flaw. I started out clueless about wheeling and didn't want to spend too much until I'd tried it. Generics and Airwheels are priced for that type of buyer. First day riding I met a woman who was out on an airwheel X5 who showed me a scar across her forehead and told me the knocked out nine teeth when she faceplanted off of her wheel a year ago. to become more commonplace as the number of aged wheels grows. When you've been riding comfortably for a long time you don't expect a design flaw to have been there from the beginning that will inevitably hurt you if you ride long enough, so it shocked me. They are still being sold new and the design flaw is a bit like the Takata airbags problem on a smaller scale. to be possible because mishaps can happen and once the wheel speed is faster than running speed, falls would be difficult to avoid and at that speed hurt. Being able to step off is great for safety. Overleans are common on my X8 but OK when stepping off is easy. How is it solved in the other brands, have wheel manufacturers abandoned low voltage battery protection entirely? Have they implemented the solution I suggested under the heading What Can Manufacturers Do? . If I go to buy a wheel BMS from Aliexpress I see they have low voltage shutdown and if I buy a replacement battery they have low voltage shutdown. One of my shutdowns was inevitable because the replacement battery had the low voltage shutdown set higher than the X8 tilt back voltage, which must happen to others as well. You have to have a good understanding of the issues to even think of checking this. Yes, they (unfortunatly) have this nice brandname, that a lot People refer to EUC in General and are cheap, so the uninformed newbie, who did not search a bit for knowledge before throwing 500+ bucks in the trunk, still will buy this old tech EUC. To your BMS/Battery Problem: What do you exspect when you buy a cheap Batterie from China on aliexpress? Sure they are not specialized for EUC's...it is mostly a BMS which has it's best use for an electric bike. Sure, on an airwheel i wouldn't think about driving 30kmh, too :-) And yes, on 30kmh you dont run off the wheel anymore, so you Need a good one, where you dont have to. Today's(Quality) wheels you can buy have -at least- this 30kmh Speed....and there are Performance models which even go to 50kmh. Perhaps you cant imagine that, but i rode my own Kingsong and Gotway 18 Inch models for over a 1,5 years now with high Speeds up to 40kmh...and i did not have even one overlean, not one Cut-off, not one Fall because of failure on the wheel or low battery problems.....And btw. : After about 4000km the cells still have the same capacity and power. That’s good to hear because I absolutely love my KS18S. I wish I could take it apart and wrap the shell to cover up my “learning scars” ? Orbtronic 18650 PD are Panasonic and they are the same quality as GW, KS battery cells if not exactly the same cell. The only mistake of Airwheel is to provide small capacity li-ion battery pack : main issues are lack of power and faster aging because more cycles are needed than bigger batteries. - use of LiFePO4 because the voltage do not drop as much as li-ion so no need to compensate with greater current. Greater cycle life. - last option (not best) is to use more recent 18650 battery cells from Panasonic for example. 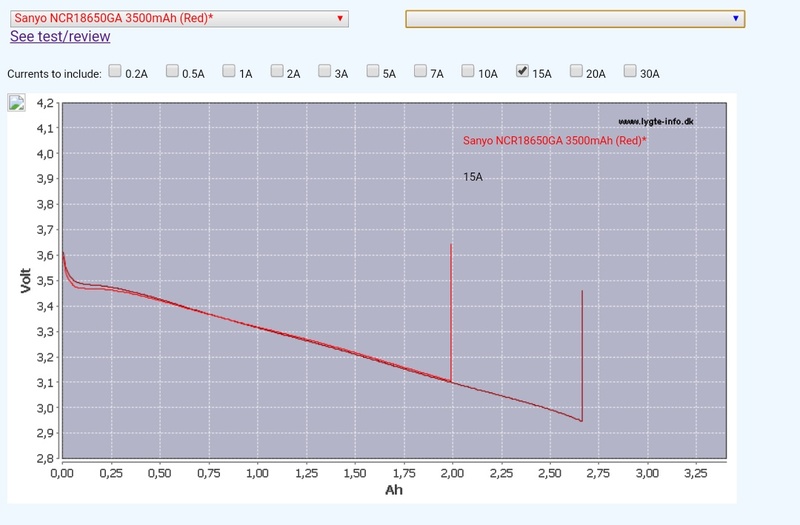 As a comparison, Panasonic 18650PD vs 18650GA (able to deliver 15A sustained also) used in Mten3. What I think is a good approximation (at least for GW and some KS) : packs rating multiple of 340Wh are Panasonic NCR18650PF (very similar to PD). If the test had to be stopped because of high temperature, that tells me that the cell is not suitable for cont. 15A draw. As for the 512Wh wheels, those batteries are perfectly capable of delivering 1,48 kW cont., peak should be double that amount. If you don't climb up endless steep hills at high speed, you'll never reach those power consumtions. Cruising at 25 kph needs about 400W delivered from the battery, which translates to a moderate 2,7A per cell. 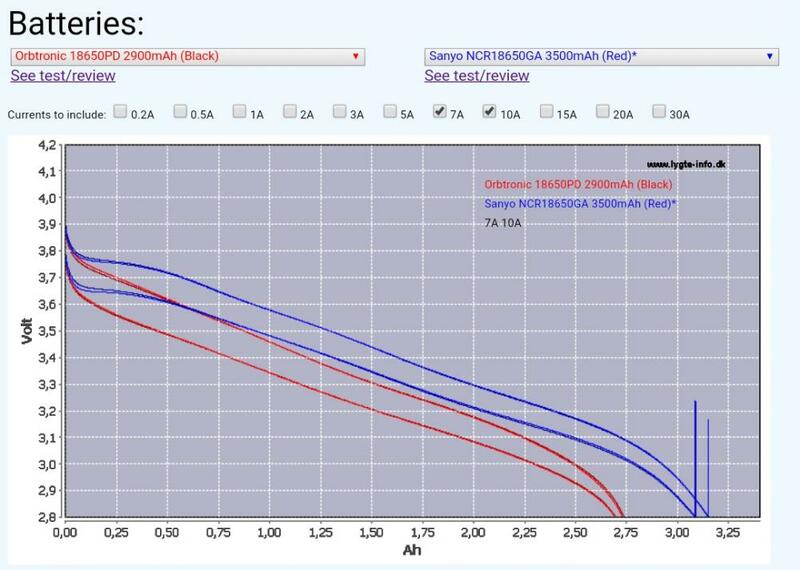 They are able to cope but they will age much faster than my MCM4 680Wh for example. high temperature, that tells me that the cell is not suitable for cont. 15A draw. 400W delivered from the battery, which translates to a moderate 2,7A per cell. Not so simple, maybe because it is 10" or the motor is too powerful or not efficient at low/medium speed. I have already started to do some measures, below is some results I have shared for downhill / flat. But I do every day the same uphill (about 1-2min 10% at 20-25km/h), it is quite demanding. @jbwheel yes, aging is a little faster with higher amps drawn. 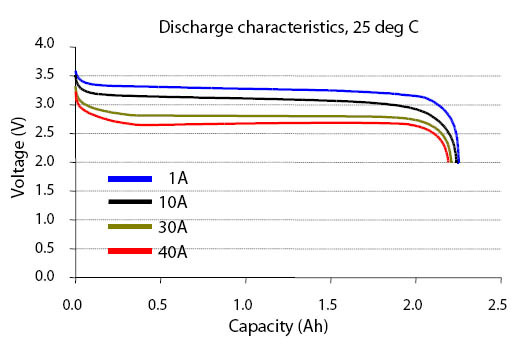 But still the main factor for battery aging remains cycle depth, especially when the amps drawn are quite well within the specified capabilities of the battery. If it takes you longer than an hour to empty the battery, the average consumption is below 1C... 1C in this case translates to 3,5A/cell. The cells are specified for up to 10A continuous (with continuous meaning constant draw until the battery is empty!). No battery manufacturer specifies a peak amperage, so that's left to guesswork. As for that diagram, how were those figures collected? Let me guess, you took a smartphone app like wheellog or darknessbot... those figures are on the one hand unreliable and on the other hand it's the motor current, not the battery current. As the motor controller works as a stap down converter, the amperage on the motor side is, depending on the speed, much higher than on the battery side. I don't know if you are a seller but you are very misleading. Aging is not a matter of averaging but how much actual stress (xC) you put on the battery (typical for li-ion is 500cycles, 1C). GA max discharge rate is 10A (~3C) but it is able to deliver in a continuous steady state 15A (electrical definition, 4C+) which 18650PF is not able to do. Using it like that (strong acceleration, uphill, ...) IS still stressfull when a good li-po would not even feel it (not mentioning cold weather conditions). As a consequence, peak power for GA (a fraction of second to 10s following A123 definition) is probably much higher, reducing faceplant probability. For the diagram, you are right, it comes from the wheel. Which is still an indicator since @LEE4ERmeasured with a ampmeter 30A battery side, on a less powerful wheel (MCM4) pressing it just with his hands. See also other results obtained with eagle tree logger etc. This guy demonstrates the technique for an unpowered dismount. I would recommend to anyone, and in particular anyone in fear of wheel failures, to train unpowered mounting on a regular basis. It is somewhat less difficult than expected. I have been practicing cutting off the wheel under me at low speed, but it turns out to be very quickly a rather boring exercise. Maybe I should go back to my old IPS to be able to do this at higher speed as well. He was preparing for it. The unplanned cut off is the difficult one. How do you accomplish this exactly? As far as I know it's not possible to turn off a wheel while it's moving. He would have to install some sort of switch,either cutting board power or a 3pole disconnecting the motor wires. I agree, yet I have my doubts that's what he's doing. Thanks for the reply @jbwheel I wasn't concentrating on battery life but safety issues though I did comment on distance per charge in the full article which a bigger battery would disproportionately improve. I've added Airwheel X8 tilt back and cut off voltages in your battery graph. 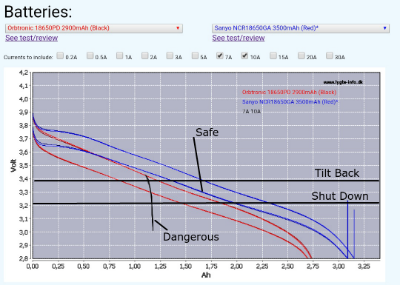 It looks safe to me as there is a good horizontal distance between tilt back and shut down. The problem comes when the graph goes vertical as I've illustrated with the added curve marked "dangerous"which happened with damaged batteries for me but will happen with all batteries when they get old enough. Then shut down happens without there being time for a tilt back. @Mono it never occurred to me to practice unpowered dismounts. As @Marty Backe said, I don't know even know how to do it. I've tried starting unpowered a few times but never been able to mount successfully. I thought it was impossible. I wasn't concentrating on battery life but safety issues though I did comment on distance per charge in the full article which a bigger battery would disproportionately improve. As said before, the good choice is a battery which high current capability so that voltage would not drop (lipo like @EUC Extremedid or good LiFePO4) when current need is multiplied by 3 or 4 = consistent behavior from the beginning to the end. Even more important, where LiFe cells are concerned, is the very high current capability with tiny drop in voltage, meaning you do not need massive packs to get safety out of LiFe cells they will hold their voltage until virtually empty. As well, of course having massively higher cycle life. So they are absolutely ideal for “last mile” light weight commuting rather than going miles and miles on the things. Several wheel manufacturers have used LiFePO4 batteries, including Solowheel and Uniwheel. Universally, at least within this forum, users have complained vociferously about the cost versus poor capacity. So, bottom line, people do not want to pay the price that short range LiFe wheels cost. IMHO, cold weather is every bit as dangerous as aged batteries and, actually, does an awful lot of aging itself. I keep my model aircraft batteries in a heated bag in winter now.